To Hike or Not to Hike has never really been a question for me. Hiking is like breathing, and I guess you could say I’ve felt suffocated since my last time in the woods. I’ve gone on a few hikes here and there, but my last real hike was way back in 2012-2013 when I studied baboons for 6 months in South Africa. I would hike 9-11 hours a day, 5 days a week, following two different troops; learning their names and habits and recording their behavior. I experienced the forest and the mountains and the fields and the streams. And now, 2 years later, mechanical legs and the smell of pines in the crisp morning sun seem like a distant dream, as I sit in my cramped apartment with cars honking and neighbors shouting and why does Springer Mountain have to be so far away? I am so ready to get started. To get on the plane with ticket in hand to Georgia. To take my first steps up Amicalola Falls. To gasp and pant at the top and to have those first hundred beads of sweat dripping into the earth. To saturate the soles of my feet so that once I reach the top of Katahdin, my soul can be saturated as well. I’m ready for the hardship and the patience and the nights spent rocking in my hammock, wondering what that sound is outside, and waking up the next day just that much stronger because I didn’t give up. I’m ready for the dirty clothes and the freezing snow and the twang of anxiety when I lose cell reception when I think I’d need it most. And I’m ready for the moment when I realize that I don’t need my cell phone to be connected. That the connection has been there all along. My feet, padding along the rough and tough trail of Appalachia. The trees blowing in the wind and the morning song of the birds, waking up the earth like children ready for santa’s presents—ready for the surprise and joy of the new day. I am so ready for that feeling. Until then all I can do is prepare. But, for now, let me tell you a bit about myself. I am a lost girl in my late twenties, desperately clinging to the hope that all my childhood expectations about life are right and that the world is a bright, cheery place with morality backing up even the most simplest of decisions. A girl can only cling so long till the threads tear and there’s nothing left to hold onto. My adult life has watched the seams begin to rip and the fabric begin to split apart, piece by piece, but I’m still reaching, still looking for that childhood mysticism that I once took for granted so many years ago. You see, back when I studied baboons in Africa—the zenith of my career in primatology—I was taught a very real lesson on humanity and conservation and everything bad about what we’re doing to animals. 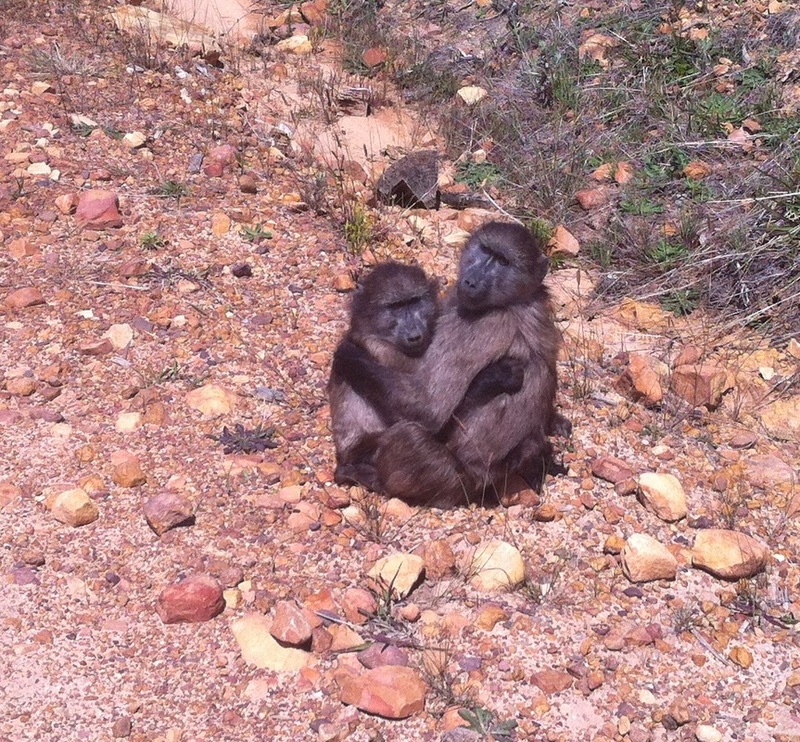 Along with a couple other volunteers, I learned more than the identities of some 60 odd baboons—being able to spot them from 10, 50, a 100 feet away—I learned their behaviors. Every day was like experiencing first-hand miniature dramas of life unfolding within two troops of monkeys. I saw fights, births, snuggles, chases, I even saw a teenage male ride into battle like a warrior with his mom’s infant clinging to his back for protection, and I saw all the males in the troop help save a mother while she vigorously fought for her child’s life. And I saw fights so close they would brush by me as I stood still, clutching my notebook like it was going to save me from their canines and their bodies built of pure power. And I saw death. Oh, so many deaths. Filia and her baby, Fay. 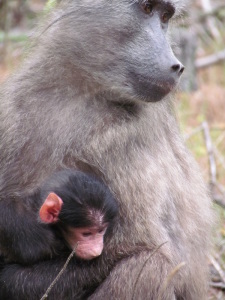 My favorite baboon, Filia, lost her baby after just two weeks. Internal injury, probably, from one of the big fights. I watched her through my binoculars for the next 5 days as she dragged her baby’s dead body around with her, unable to let go, or not used to the idea of having to. Infant Carry. Infant Hold. Infant dead as her family and friends watched her continue a life of denial, hoping that her child would wake up and suckle again. Once more. Just once. And then, gone. She left her one day and we never saw her baby again. And it was tough, sure. It was hard seeing my furry friend go through the first tragic event of her life, and even harder to not be able to reach out and help. But, so it goes. Out there in the woods, we researchers were powerless against so many things. Namely, the SPCA and the national park system itself. You see, we were threatened under penalty of losing our research permit to not speak about or write about what really happened out there in those woods. Those innocent pines and eucalyptus imported into a life of witnessing humanity’s true colors, and being bound to their bark and their roots to stay quiet, to stay still. If those trees could talk…but since they can’t, I’m ready to now. 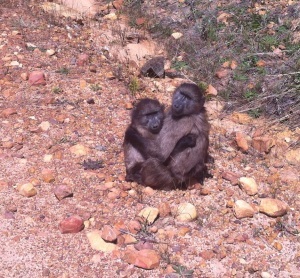 While I was there, I witnessed the national park system kill 9 male baboons and the SPCA kill 1 female baboon. Why? Why would a national park built around the ideals of upholding nature and wildlife do such a thing? And why the hell would the SPCA of all organizations kill a creature of the park? Literally shoot it in the head with a shotgun? How could this actually happen? Well there’s a lot of reasons I’ve mulled over for the past couple years—greed, ignorance, lack of enforcement, malice, and the list goes on. But, here’s what happened. The alpha male, Hamlet, looking over a kingdom that was once his. 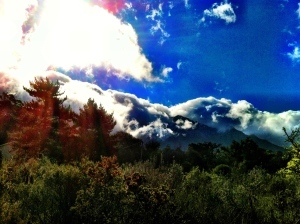 You see, the park—Tokai National park for those of you who want to google—is situated right alongside a suburb, Zwaanswyk. Literally right alongside. All that separates the wild from the urban is a faulty electric fence meant to shock—and sometimes kill—whatever wants to come across for a visit. I saw so many baboons jump over it via trees and even more sneak through holes and even some climb right over because they had failed to turn the damn thing on. It didn’t work: problem 1. But why a fence? Because the baboons are opportunists. They are wild animals who seek food and will do anything to cut costs, especially at the hands of greater benefit. Why would they think the humans will have food? Because people feed them. They throw them food on a whim or for whatever reason, and then that monkey learns the life lesson that’s draining their blood and spilling it all over the mountainside: people are a food source. It’s one thing to feed a tiny little baby baboon, but quite another to have his daddy show up through your open window, going though your refrigerator like a college kid come home for the holidays. 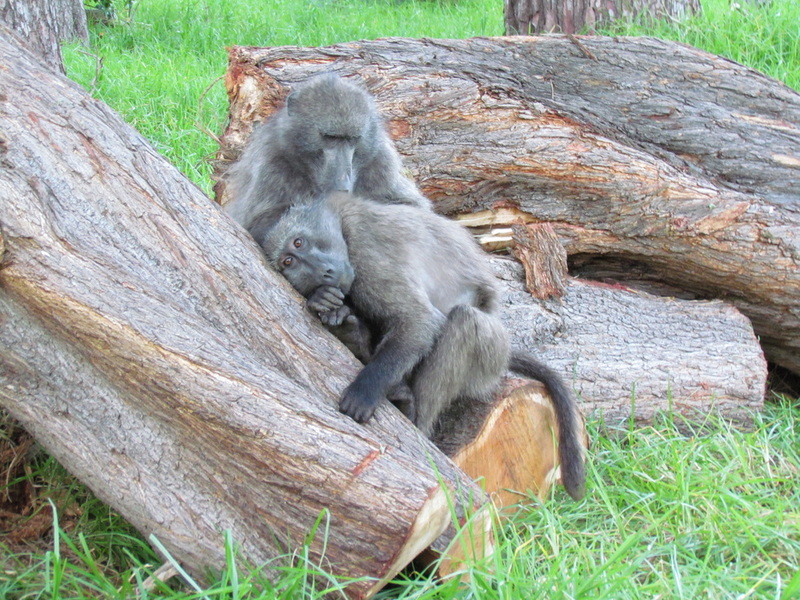 There’s even two picnic areas in the park and a restaurant with ample outdoor seating—all three of which are located directly below the trees of 3 of the baboon’s sleepsites. So, basically the park is ringing the dinner bell, sayin’ “come get your free meal!” It’s illegal to feed them, sure. But it’s a rule never enforced. Hell, I’ve seen the park officials themselves hand-feed baboons several times. So, the people hate the baboons because, for some reason now, all they want is another cheeseburger (“jeez, I gave that big hairy one a whole pizza last week, how hungry can they get?”). 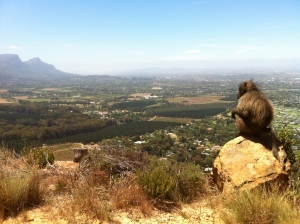 So, the park hired baboon monitors to paintball the baboons if they got too close to the edges of civilization. At first, I thought it was an awful idea. But after a few weeks of seeing it work, I changed my mind. It harms them far less than killing them outright and it helps enforce the idea that raiding human homes is a bad idea. But, per usual, it’s not regulated properly and I watched the monitors feed the baboons and watched as they slept through their shift, missing the big adult male as the baboon paid a visit to the bakery for his free carrot cake (true story). So, when a baboon was caught raiding a bunch, he was tagged, then, if he kept raiding, he was killed. They killed all but 2 of the adult males while I was there, and shortly after my departure, they killed the rest, leaving the harems leaderless. I’m hiking the Appalachian trail for a number of reasons. Better shape, more self-confidence, adventure, the ability to say I’ve done it, and more. Much more. But, the biggest reason why I’m doing it is all wrapped up in what I lost that day when they shot Sad. What I lost those days when I watched each adult male be killed. It’s what I lost when I looked at the SPCA authority in his beat up truck, and begged for an innocent creature’s life. It’s what I lost when I didn’t do anything about it. I’m hiking the trail to prove to myself that the world is not cruel. That yes it can be harsh, and yes rains and storms will happen. But that the sun shines too. That there’s kindness in strangers. That man has been good all along and that my hope for humanity and nature isn’t folly. That I was right in choosing a career path aligned with animals and the wild. That those seven years of my life weren’t wasted. I want to reconnect with the earth and with it’s people. And I want to climb atop Mount Katahdin, and know that there’s hope. Hey! I'm Jen. People say that I'm generally funny, can be quite zany, and love to go on wild adventures. I have a deep love for animals and the outdoors, and have studied monkeys in several countries for seven years (see my website at jenniferlegan.com for more info). So, basically, I enjoy monkeying around. My last adventure entailed 6 months of rigorous research, studying baboons in South Africa. I saw baboons grow bonds and I saw baboons get killed, and, somewhere along the way, I lost my faith in conservation. So, among many other reasons, I am thru-hiking the AT (NOBO) to reconnect with the wild and with humanity—to rediscover what makes mankind a wonderful species, and to prove to myself that I can overcome even the most drastic of challenges.